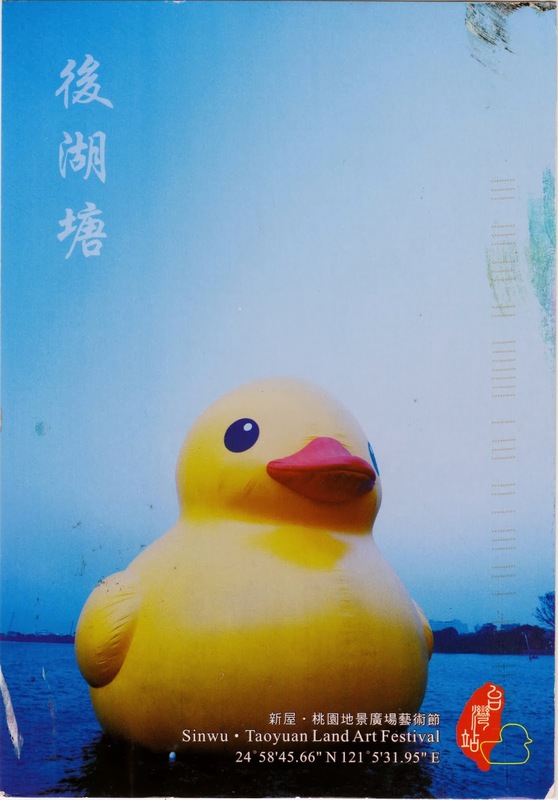 The yellow duck came from Taiwan as a private swap. It was one of those world's largest rubber ducks, created by Dutch artist Florentijn Hofman, usually at 16.5 × 20 × 32 meters in dimension and over 600 kg in weight. Since 2007, several ducks in various sizes licensed by Hofman have toured several countries and territories such as Amsterdam in Netherlands, Lommel in Belgium, and most recently Taoyuan in Taiwan. Hofman created the giant rubber duck for a tour named "Spreading Joy Around the World" in 2007 by bringing back people's childhood memories. After the display at the Glory Pier in Kaohsiung went off without a hitch from September 19 to October 20, 2013, the Land Art Festival (桃園地景藝術節) in Xiwu Township, Taoyuan had its own debut of the 18-meter-tall, 18-meter-wide and 25-meter-long yellow duck on October 26, 2013. However, it became a high-profile victim of a 6.3-magnitude earthquake when an air pump went out of service on November 1 during a power outage triggered by earthquake. As a result, it deflated before exploding during an attempt to re-inflate it in high wind. Organizers at the Taoyuan County Cultural Affairs Bureau borrowed the duck commissioned by Kaohsiung city government that drew 4 million visitors. Yet the strong winds kept the alternative duck on dry ground for another few days, which made it the first Hofman's duck displayed on land. 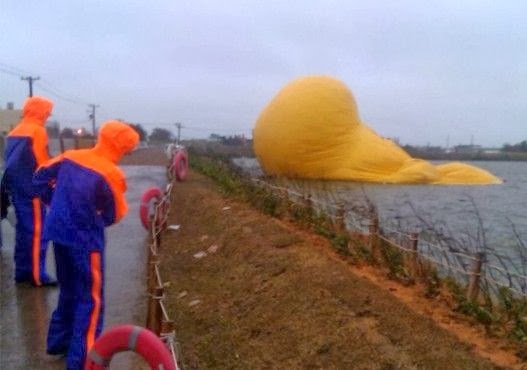 You can watch a video clip "Giant rubber duck pops in Taoyuan following earthquake" on Youtube.